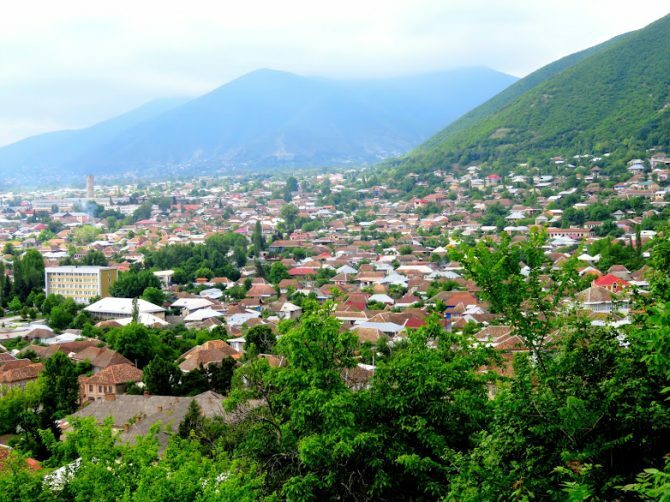 This post is a travelguide about the best things to do in Sheki. Sheki is an old town with beautiful buildings from the golden years of the Silk road. Rolling hills with lush green forests that beckon you to explore them. Delicious Azeri cuisine and local specialties hard to get elsewhere. Sheki has every reason to include it in a trip to the Caucasus, but few people visit this region. Maybe I should not write about Sheki and keep it a secret. Walking through the old town without any other tourists was part of its charm. Add friendly people and good food and I was hooked. The Caucasus has always been the battleground of different empires. Sheki once belonged to the Persians, Romans, Parthians, Arabs, Mongolians and Russians. The result is an interesting combination of cultural influences. Most of the historic buildings in town nowadays are a legacy of the Persian rule of the Shirvanshah and Soviet Russia. The Sheki Khan’s summer palace alone makes Sheki a worthwile place to visit and it is among the top things to do in Sheki. The design and frescoes are outstanding. The typical Azeri shebeke windows give it a finishing touch. You can’t take pictures inside, but they won’t do justice anyway to the intricate detailed paintings that cover every inch of the walls and ceilings. Close to the palace is a small history museum and a covered bazaar where they sell souvenirs. Not far from the summer palace is also a lesser known winter palace that is just being renovated. Even if you are not staying in the Karavan Seray hotel, it is a great place to visit in Sheki. You are free to enter the courtyard and walk around. I love exploring places on the old Silk road and nowhere did it feel so real as in Sheki. It was not hard to imagine how these places were full of traders with their camels or donkeys. The old Karavan Serai provided a secure place to sleep. If you look carefully you will still see the hooks where traders kept their animals. Sheki is the kind of town where just wandering around is pleasant enough. The strange mixture of Persian and Russian influences in the architecture is not something you will find in many places. A bit outside of Sheki is an Albanian church or temple. I was a bit confused with the country Albania, but apparently the Caucasian Albanians are a mysterious old civilization that once ruled the area and are not at all related to the present day Albanians. The temple was the center for religious traditions including animal sacrifices. It all sounded very interesting, but honestly I was more intrigued by getting a glimpse of Azerbaijans village life in Kish and the stunning mountains. This short day trip was one of my favourite things to do in Sheki. Don’t miss the statue of Tor Heyerdahl and the accompanying story claiming that the Norwegian Vikings were actually from Azerbaijan. Whenever I travel I always love to visit the local markets. Sheki’s lively bazaar is full of fresh fruits and vegetables and certainly one of the fun things to do in Sheki. Another reason I like to visit markets is that they offer some of the best local food for bargain prices.The dried nuts were delicious. Juicy kebab stands proof the freshness of the meat by showing the cow’s head. And a cup of tea is never far away. Just like in Iran, teahouses are the world of men and there are plenty if them in Sheki. The tea is boiled in a samovar and served in a pear shaped glass (armuda) with separate sugar cubes. Traditionally, you should put the sugar cube between your teeth and sip the tea through the sugar. Drinking tea is an old tradition in Azerbaijan and apparently makes or breaks marriage proposals. If the family comes together to discuss a proposal and they serve tea without sugar it means the men is rejected. On the other hand, if the tea is served sweetened the marriage preparations can begin. The great food in Sheki was not restricted to the market and trying some of the local delicacies is one of the great things to do in Sheki. In the Caucasus it becomes difficult to keep track of all the great food experiences you will have, but Sheki Halva makes it high up the list. The sweet made of nuts, walnuts, butter, sugar and spices melts on your mouth and the taste is something you’ll not forget easily. If not for the history and mountains, come to Sheki for Sheki halva. Sheki Halva is not the only specialty of the region. Sheki also has some of the best piti in the country. The stew made of lamb, sheep fat, chickpeas, onions, chestnuts, saffron and spices is cooked in a claypot and eaten in a particular way. First you should pour the liquid on your plate and eat it with some of the bread. Then you should mash the rest of the stew together and eat it with the bread. It is similar to dizi in Iran, but with the chestnuts the Azeri version is even better. Tandyr naan, similar to tandoori naan in India, is a flatbread from a clay oven. If they are still crispy and hot they are the best bread you will ever eat. Shekki has some traditional bakeries where they are served right from the oven. Head to the market for juicy kebabs, fresh bread and tea. At first sight I thought this place must be above my budget, but prices were reasonable and similar to other restaurants in Sheki. The food was delicious and it is a great place to order Sheki piti with a fresh salad. The name says it all. The sheki panorama guesthouse offers the best view over the city. If you are travelling on a budget this is one of the cheapest options. For solo travellers they have a dormitory for bargain prices. The people are extremely friendly and helpful and prepare a delicious breakfast (included). Not as cheap as the panorama guesthouse and without the view. However, the experience of sleeping in an old caravan seray is something special. I did not sleep here, but I did visit the hotel and it looks beautiful. For a recent review head to wander-lush. From Sheki to Baku there are both trains and buses. Buses take 6 hours and leave throughout the day. The nighttrain takes 12 hours, but saves you a night of accomodation and is an experience in itself. To read more about this train journey you can read my post on the Baku express: the train from Sheki to Baku. You can also use Sheki to cross the border from Georgia. I travelled from Sighnaghi to Sheki. A scenic and smooth journey. To read more about this journey you can read my post on Crossing the border to Azerbaijan: from Sighnaghi to Sheki. To read more about Azerbaijan you can read my posts on the best things to do in Baku, the best daytrips from Baku and Xinaliq. Such lovely buildings and gardens and my mouth is watering just thinking of halva. It is one of my favourite sweet treats. I need to stay in the Caravan Seray Hotel! Really want to visit Azerbaijan (& Armenia / Georgia) in the next few months. Gonna go through some of your blog posts for further inspo. This little place sounds lovely.